Who doesn't love a shirt dress? They're simple and cute, yet still manage to retain a vintage edge. Plus, you've got your whole outfit sorted at once, just do up a few buttons and you're good to go. I love them. I've got a few in my wardrobe but my absolute favourite is a navy polka dot one from Primark that's definitely on its last legs. Amazingly for Primark tat, it's seven years old but this really and truly is its last summer - if nothing else, the many washes it's had has faded the colour and it looks very weary. It's time for a replacement. I've been on the search for the perfect shirt dress pattern for awhile, and seem to have amassed quite a few vintage ones. Who would have thought there was such variety? I wanted to make one that I'd wear as much as my beloved worn out Primark specimen. There was a big temptation to make another version of the kimono-sleeved wiggle dress I made for the Mad Men dress challenge. But strangely, there's not much call for skin tight wiggle dresses down at the school gates and it probably wouldn't get worn as much as it deserves to do. So.... amidst all that vintage glory, what did I decide on? Well, if you follow Peter on Pinterest, you'll know he has a board entitled Worst Women's Patterns EVER and yes, on first glance, you'd be forgiven for thinking that my chosen pattern - the monster that is McCall's 4769 - deserves to be cast amongst the mutant patterns there. But look carefully and you'll notice that it does have a lot of potential. The collar shaping is pretty and it's got just the right amount of shape to the skirt - not too full and not too pencilly. Once I've chopped a whole foot off the length, I KNOW this pattern will be awesome, I just know it.... It's like going to view a house and being able to see the home of your dreams underneath the artexed ceilings and stone cladding. Plus, it's too late to change my mind now because I've cut it out. 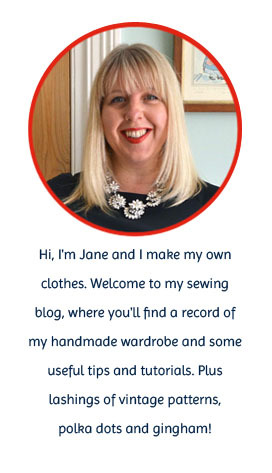 I'll be using a sky blue and red polka dot cotton, along with the red vintage buttons you can see on my blog header. Oh gawd, I'm getting the beginnings of cold feet now that I've written it all down. I really hope I haven't pissed on my chips. Whatever the result, I'll post the finished dress here, whether I end up with a stunning replacement or end up looking like the blonde frump modelling view C.
Also up for grabs is Maudella 5184 - if you can see past the helmeted matrons on the front, I'm sure this will make a very chic shirtdress. It's bust size 38. If you'd like any of them, just leave a comment on this post, stating which one you're interested in (you're welcome to put your name down for both) and I'll draw names out of a hat. I'll leave this open until the end of the day on Sunday 3rd June. Good luck! You had me at "polka dot with red buttons!" It sounds fabulous, and lots of fun to wear. Can't wait to see it! Oh, I do love the Vogue and Maudella patterns. I can't decide, they are both beautiful. Thank you for the giveaway. Oh, and while the patterns are lovely, I'm thinking that mailing all the way from England to Canada might be a bit crazy, so I'll pass on the giveaway! We're having a moment of syncronisity as I'm also in the middle of shirt dress plotting (although I haven't got as far as cutting!) and have come down to the Lisette pattern, but it may well get bumped if I'm lucky enough to land your Maudella pattern! All I'd need to do is FBA it as its a vintage pattern in near as my size! I can't wait to see what yours is like. I'm hoping to use some Navy broderie angalise with a red lining and then red buttons... Lining and buttons still to be sourced!! Simplicity for me, and I am curious now to see the primark dress, will the new one live up to it? I think Vogue's shirtwaist dresses of that time are some of the loveliest. So beautifully elegant. I think that your dress sounds like it will turn out great. Thank you for the giveaway. A shirtwaist dress is a must for a great vintage wardrobe. I love the Maudella. i have new look 4769 too! i've been hesitating using that pattern because of the cover model also, how funny! cant wait to see how yours turns out, and if i may, i'd like to put my hat in for Maudella. thanks! Granted I used the Sewaholic's Lonsdale skirt and I drafted a different sleeve, but for the most part, that McCall's pattern has very good bones. Make it up - you'll love it. Plus you'll love how much you can do with it in the end too. You can swap out different skirt options and make it up with different sleeve and collar variations too. I know the cover model looks pretty sad, but really the pattern is good - its one of those screaming for you to look past the pattern envelope! I ADORE that raglan sleeve pattern. Oh my goodness - I do so wish you would give it up to me, even though I know its not in the giveaway! Ha ha! Can't wait to see what you come up with! I'm sure it will be chic and fabulous, as always! To my shame I have that pattern pinned because I liked the polka dot version shown in the side panel next to the main photo. I think it has potential and with a bit chopped off the length it could be very nice indeed. You know, I was kind of surprised to hear that pattern made it to 'worst patterns ever' - because I saw the potential you did, and aside from the odd length, the dress is a very nice wearable style - I totally envisioned you wearing it and looking great!! I LOVE the phrase 'pissed on my chips', I'm totally going to introduce it into my daily vocabulary. I would like to enter to win either pattern, is that too greedy? I hope I haven't pissed on my chips* by looking greedy. Looking forward to seeing your dress. Funnily enough I was thinking today how a shirt dress would be smart for the Summer. I shall have to check out my pattern stash. I like the Maudella but I think the Simplicity would be a better bet as it doesn't have a waist. I would add darts however at the back and front, much like the darts normally found in a shift dress. Thank you for the chance to enter the giveaway. How funny! I also have a Primark shirt dress I want to replace and have been sorting through my multiple shirt dress patterns to find just the right one! You have a great selection - love the raglan sleeve version, after discovering how easy they are I'd be tempted to make that one. Or the McCalls with the vertical seams would look lovely. I love both the giveaway patterns but I think the Simplicity one would be my fave as it looks easy to wear every day. I'd like to win the Simplicity pattern. Polkadots and red buttons sound great! I have the same McCall's pattern in my stash - I'm eager to see how your make turns out! Hello, I'd like to win the Simplicity pattern, and I want to say you thanks to give us this chance to win a pattern. The Maudella was made for me. It is so hard to find a size 38 bust. Truth be told, they are all lovely. 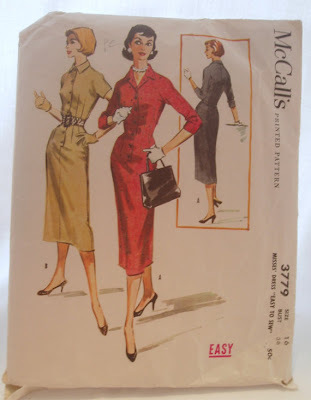 I keep to-ing and fro-ing on the McCalls pattern, as I see the potential, but am not sure if I can get past the cover styling! The Maudella shirtdress is lovely though, so would gladly throw my hat in the ring for your giveaway. Peter doesn't always have perfect taste :). I like the McCalls pattern, if you ignore the made up version on the front. (Count me out for the giveaway - neither pattern would suit me). Have you considered dying your Primark dress - you might lose the polka-dots (or get very faint polka-dots) but may get another season or two out of it. Or dig out every single dress, top and skirt pattern you've ever sewn successfully and see which, if any, pattern pieces are the same as your beloved dress and then make the bestest frankenpattern ever! I'm not entering myself for any more, have dinner lady chic a plenty and hope your chips are fine!!!! I have seen Peter's pinterest wall! Man there are some awful patterns out there. I like your choice of McCall's 4769, I think with a less busy fabric and made a tad bit shorter it will be fabulous. I enjoy reading your ever since I found your Joan dress from Julia Bobbin's mad men challenge. I would like the simplicity pattern because its in my bust size. I don't agree with all of Peter's worst pattern choices. There is one very promising trouser suit that caught my eye. I'd love to win the Maudella pattern and I thought your Vogue pattern was the best of fine batch. Can't wait to see your dress Jane. I agree, it will look loads better as a shorter length. Would love to win either of those patterns please have been having a look round for just such a dress style. I'd love to win the Maudella pattern - I've been looking for something like that for awhile! I think your dress will look fab! The buttons and the polka dots sound great and I actually like the pattern photo you have minus the extra length. I often chop off some of the length on vintage patterns anyway. I would love to enter for the Maudella pattern as I think it is really stunning. I can't wait to see how your dress turns out as I agree, the pattern cover is BLAH. I would love the Simplicity 6700 dress pattern. Fingers crossed! Hi Jane, I actually made the McCalls pattern..And I love it.. It is one of my favorite shirt waist dresses.. I am old [ha] but even my daughter ,who is in her 30's [a school teacher], loves this pattern.I think you will be very happy with it.Can't wait to see yours..Happy sewing. Nice post... Buy Pencil Skirts for Women online from Ebay. we are the fastest growing fashion retailer in uk. our prices is better then market. Buy now and get free delivery in Alton, Hampshire and other United Kingdom location.